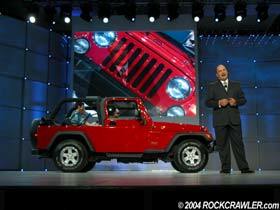 Detroit, MI - January 5, 2004 - This morning, Jeep debuted the production version of the long-awaited 2004 1/2 Wrangler Unlimited. To industry insiders and in-the-know enthusiasts, the Wrangler Unlimited isn't exactly a complete surprise. Jeep has hinted for the last couple of years that a long-wheelbase TJ might be in the works and they even displayed both a long wheelbase TJ and a Scrambler pickup style TJ at Camp Jeep two years ago. Then, in cooperation with AEV Conversions, the Brute pickup appeared at the 2002 SEMA Show. One of the latest hints came in 2003, when word hit the street that the Toledo plant, where TJs are built, was tooling up to be able to produce a long wheelbase Wrangler. So we all knew that Jeep had something up their sleeves, but they weren't telling exactly what. But now we all know exactly what it is, and its name is "Jeep Wrangler Unlimited." 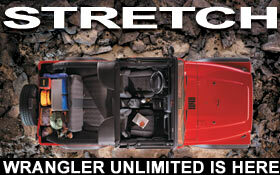 Internally, during the development phase, the Wrangler Unlimited was refered to as the TJD. Of course, this isn't the first long wheelbase Jeep of this kind. In 1956, Willys adapted the military M170 for civilian use and dubbed it the CJ-6. The final version of the CJ-6 had a 104" wheelbase, and though the CJ-6 did not stand the test of time commercially like it's shorter brother, the CJ-7, it has found a loyal following in the off-road community, simply because of its longer wheelbase. In more recent years, Jeep has been manufacturing a long wheelbase vehicle for the Egyptian military, dubbed TJL. At a glance, this 112" wheelbase model looks to be a very long wheelbase Wrangler, however, that look is only skin deep, as this model has 1 ton running gear for charging across the desert with a rocket launcher onboard. Learn more about the Jeep Wrangler Unlimited, including official press releases and inital specifications. Click here. So this brings us back to what we see here on this page. The new Jeep Wrangler Unlimited is essentially a TJ Sport model, stretched 10" in the wheelbase (103" total) and 5" behind the rear wheel. Total overall length is now 167" bumper to bumper. The Wrangler Unlimited's 15 extra inches allow for 13 inches of additional cargo area and two inches more of second-row leg and knee space. So now, adults will actually be able to ride in the back and not be quite so cramped. Behind the seat, or with it removed, cargo space is greatly improved, as well. The extra length will also give the Jeep an additional 1,500 pounds of towing capacity of standard Wranglers, bringing it to 3,500 lbs. If all of this wasn't good enough news, there is more. The Unlimited is available with a Sunrider top or a hard top. The Sunrider allows the front passengers to flip the front section of the soft top back, providing a 45" x 23" sun roof opening. The tops fit essentially the same way as on standard Wranglers - they are just longer - and have a larger window in the rear giving rear passengers a much better view. The Wrangler Unlimited comes standard with the same 4.0L, 190 bhp Power Tech I-6 and 42RLE four-speed automatic, and NV231 Command-TRAC transfer case as found on the TJ. Initially, only an automatic version will be available, in the interest of bringing the Unlimited to market quickly. It makes sense, of course, that a 5 speed manual version should follow in the next year. Axles consist of a Dana 30 with disk brakes up front and a Dana 44 with disk brakes and a limited slip in the rear. Both run 3.73 gears. Tires are 30" Goodyears. Underneath, differences from the standard Wrangler include a 10" longer driveshaft, one extra body mount on each side and longer wires, fuel lines and harnesses. Control arms are the same ones used on the standard TJ. Approach angle is 44 degrees, breakover angle is 22 degrees, and departure angle is 27 degrees. A standard TJ approach angle is 42 degrees with a 28.1 degree breakover and a 31.9 degree departure angle. The burning question remaining unanswered, is whether or not there will be a Rubicon version of the Unlimited. Jeep is keeping tight-lipped and saying no for now, however, we're not sure how they could build the Unlimited and get away with not doing a Rubicon version of it. Pricing has not yet been announced but being that the Unlimited is on sale this April, it should be available soon. Unlike this new Jeeps name, production numbers will not be unlimited. If you want one, you better call your dealer now and get your order in. To learn more about the Jeep Wrangler Unlimited, including all Jeep press releases and initial specifications, click here.